Commercial Collection Agencies of America visited with hundreds of credit professionals last week at the annual Credit Congress. A picture of our vibrant booth is at left. The message: Commercial Collection Agencies of America has a superior certification program for commercial collection agencies and stellar educational programming for agencies, attorneys and credit personnel. Credit professionals learned that the logo of the organization, which represents the four pillars: experience, education, ethics and expertise is the logo to look for when choosing a certified agency. The staff also distributed useful statistical reports and primers on the different stages of the collection process, which were welcomed by the credit managers. Many credit managers noted that the information created by Commercial Collection Agencies of America is not only useful in the credit department, but also when the credit department interfaces with sales and upper management. If you missed us and would like to receive information, please contact awaggoner@commercialcollectionagenciesofamerica.com or call Executive Director, Annette M. Waggoner at 847-907-4670 for your free copies. Commercial Collection Agencies of America's spring meeting in San Diego was a mecca for advanced learning for attendees. Agency members fulfilled continuing education requirements with a syllabus of sessions geared toward commercial collections and creditors' rights. The high-level education offered at the meeting fit with the persona of Commercial Collection Agencies of America - the ONLY certifying body in which ALL agency members are certified; whose members have been in the debt collection industry for decades, many of whom have been certified for over forty-four (44) years. "Our members crave a challenging curriculum of classes and the organization delivered. 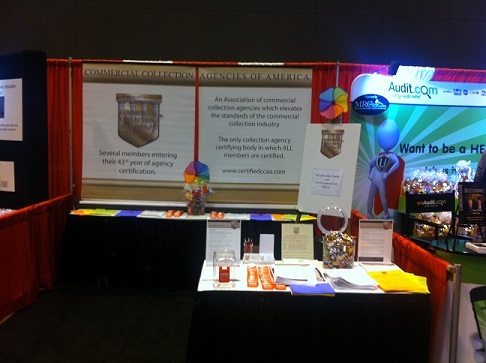 Commercial Collection Agencies of America is founded on four pillars: experience, expertise, ethics and education. Delivering top-notch, relevant and timely educational sessions is one of our goals and the spring meeting met that goal," commented Meg Scotty, President of Commercial Collection Agencies of America. Sessions covered licensing requirements and bonding, and how best to obtain and manage those licenses and bonds. A session on SSAE 16 and other audits taught members how to navigate through the audit process. Commercial Collection Agencies of America proudly welcomed the President and Past President of the North American Collection Agency Regulatory Association, who covered multiple state regulations and informed members what to expect when regulators visit an agency. During the keynote presentation, Clay Clark of Thrive15 offered a lively "tutorial" of how to take member businesses to new heights, employing operational techniques proven for advancement. "The courses offered the members the opportunity to enhance each of their skill sets; every member walked away with new, valuable and useful information," remarked Annette M. Waggoner, Executive Director. In addition to education, networking with business partners also played a big role in the spring meeting. Unique networking exercises culminated in new business relationships between agencies and creditors' rights attorneys and law list representatives. For the first time, Commercial Collection Agencies of America welcomed a plethora of vendors recognizing the importance of hosting companies whose products and services are vital for our members to operate effectively. "Commercial Collection Agencies of America realizes the benefit to our members of meeting face to-face with our vendor partners," commented board member and vendor management chair, George Bresler. Another highlight of the conference was the general membership meeting, where members discussed the many initiatives of the organization, while the board reported on the rapid progress made in its inaugural year, especially in membership. Also at the general membership meeting, Commercial Collection Agencies of America Gives Back, the organization's charitable initiative, presented a video and proudly donated a portion of the meeting's profits to the Wounded Warriors Project. Quite impressively, individual members also generously made matching donations. All attendees agreed the meeting met with great success on all fronts-a gorgeous location on San Diego's picturesque marina, excellent education, frequent networking and fun social activities. Members anxiously look forward to the organization's next meeting in Delray Beach, Florida on October 22-24, 2015.